A second former UCLA player has suffered a season-ending knee injury in training camp. After Atlanta Falcons receiver Devin Fuller tore his ACL in training camp, defensive back Randall Goforth received the same news with the Philadelphia Eagles, suffering the injury last Friday. Takkarist McKinley (shoulder) received better injury news as he has the “green light” for team drills with the Atlanta Falcons. Pro Football Focus details why Josh Rosen is still one of the best quarterbacks in the Pac-12. Defensive end Takkarist McKinley talks about finally getting a victory, celebrating with Mike Fafaul and facing USC next week. Safety Randall Goforth about his game-sealing interception, the feeling of just getting a win and next week’s rivalry. Safety Randall Goforth talks about developing versatility as a defensive back, facing fellow local product Troy Williams this weekend and what WSU receiver Gabe Marks said about UCLA players warming up in the Cougars’ side of the field. 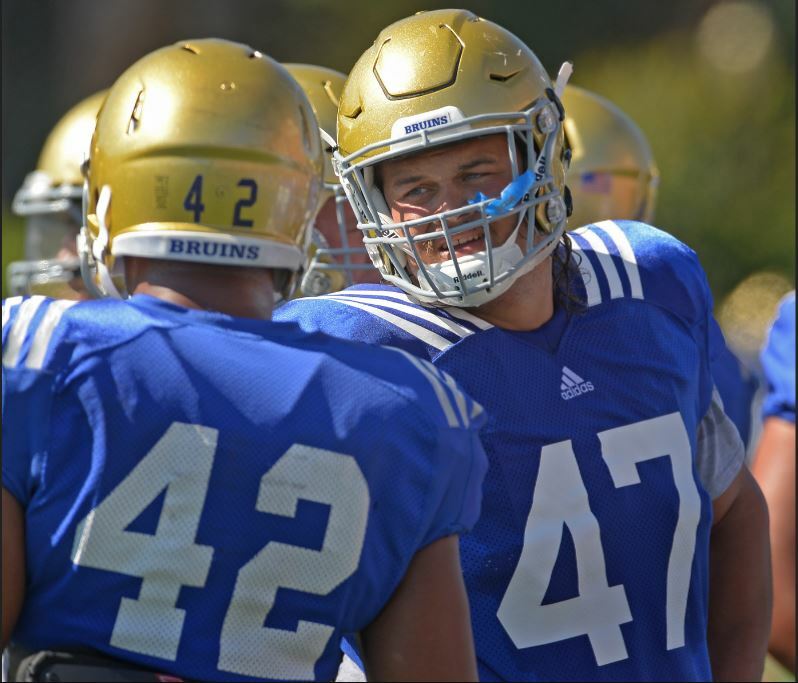 UCLA sent two big stars on defense to the NFL, but the Bruins are set to reload quickly with nine returning starters. Eddie Vanderdoes replaces first-round pick Kenny Clark in the starting lineup after a season-ending knee injury last year. Vanderdoes had never missed a game in his college career prior to his injury and made 19 combined starts during his first two years with the Bruins. Cameron Judge is set to take a starting outside linebacker role opposite Jayon Brown. Judge, a senior, played in 12 games last season and made one start while Myles Jack left school early to prepare for the NFL Draft and recover from a meniscus injury. Deon Hollins started 12 games last season as an outside linebacker in UCLA’s 3-4 front, but with the team’s switch to a 4-3, defensive end Matt Dickerson worked mostly with the No. 1 unit during training camp. Dickerson played in every game last year and made one start, against Washington State. The group’s experience is “golden,” Vanderdoes said. Head coach Jim Mora talks about the first week of training camp, the defensive backs and moving on to San Bernardino. Defensive back Fabian Moreau talks about returning to the field and how badly it hurt to play on his broken foot last year. Defensive back Randall Goforth talks about having Fabian Moreau back, playing with Jaleel Wadood and how he survives San Bernardino.